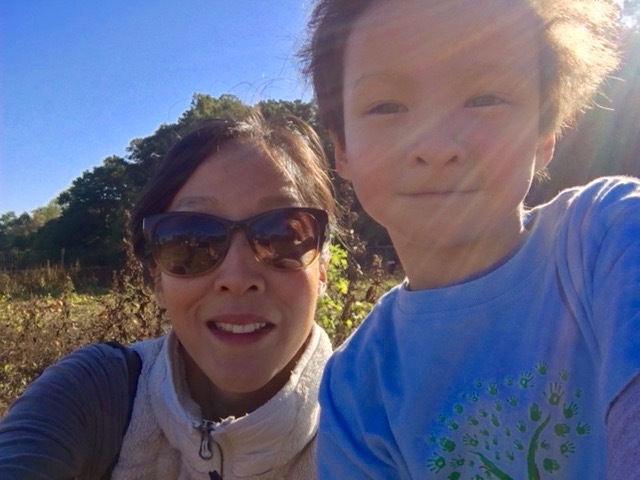 This guest post is by Jane Kim, an immigration attorney, writer and mom of a five-year-old with autism. She lives in the Philadelphia suburbs and, she says, "I can often be seen chasing after my son, who enjoys anything on wheels." A few months ago, during a particularly dark time, I was tidying up around the house and came across my baby shower scrapbook. I sat down and flipped through it tearfully, taking in the smiling faces of family and friends, tables piled high with brightly wrapped presents and three-tiered diaper cake. But there was also something invisible in the scrapbook that this mom of a child with autism had lost: hope. Then I found the notecard. 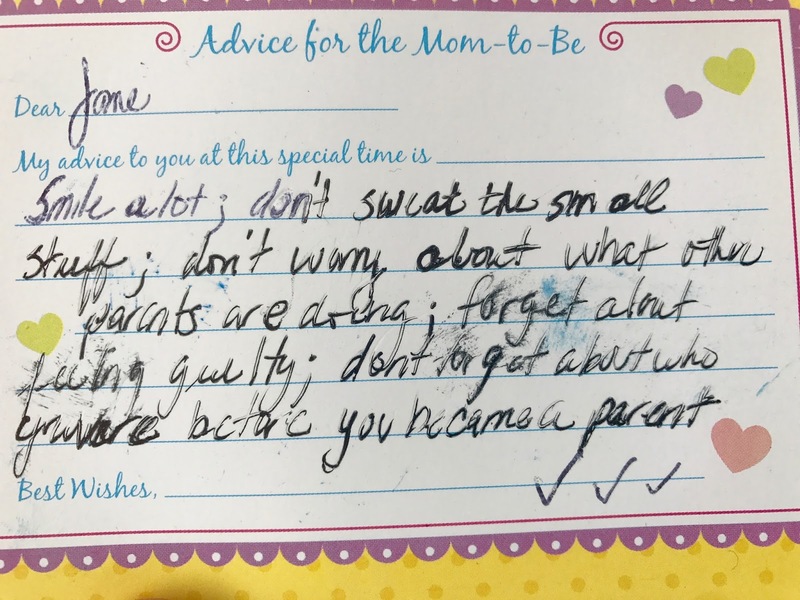 My sister had asked guests to provide advice to me, a first-time mom. Afterward, everyone voted on the card that had the best advice; this was it. Reading it was a reminder of the unexpected journey my life has taken since my son was diagnosed a few years ago. Life is so different than what I expected at that baby shower. But as I pondered the advice, I realized it was also a reminder of just how far I’ve come. This is for all parents out there who have been told their child will be different and who, like me, have struggled. 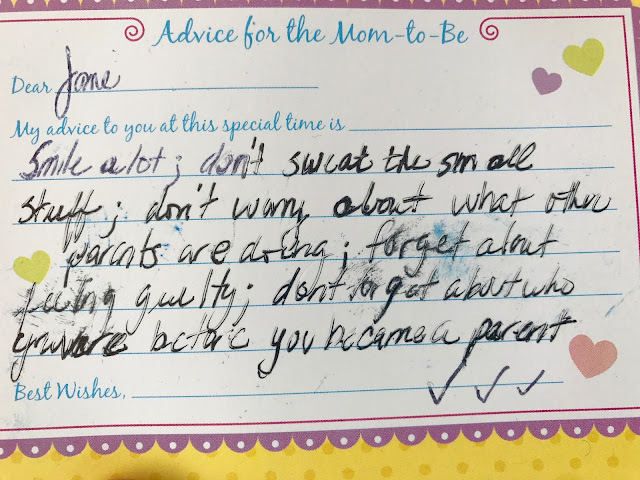 This is a reminder for all the parents who tirelessly advocate for their child, meet with therapists, incorporate their suggestions, attend numerous doctor visits and complete the never-ending piles of paperwork that you are doing the best you can. “Smile a lot,” the card said. There will be times you won’t feel like smiling. I didn’t when my son was really young. There was too much worry, uncertainty and new therapies for me to digest. What helped me regain my happiness was time, seeing a therapist, a tremendous support system and most importantly, a stronger understanding of what makes my son tick. I also learned to appreciate my son’s funny, quirky personality. I smile when when he asks to read a book or listen to a song “two times,” never just once. When my son was just a year old, his developmental pediatrician—the person we hoped would be a trusted advisor and guide for the years ahead—told us to lower our expectations for his future. That was the worst day of my life: I grieved for my son and the bright future our family had envisioned. Although we suspected he was on the spectrum, I was unprepared and unwilling to accept a future of limited possibilities at such a young age. I swiftly changed pediatricians, but the damage had already been done. From that day forward, I worried about everything: Why won’t he drink from a straw? Why didn’t he like meat or ice-cream? Why wasn’t he interested in coloring? There was so much to worry about that I started to lose sight of the big picture. I tried to rein in the worrying, but it had become bigger than me. Although I have a caring family and friends, there was only so much they could do. Ultimately, talking through the worry with my therapist helped me decipher which concerns were legitimate, which ones weren’t and how to best move forward. Today, I’m grateful I recognized the importance of seeking outside help to gain perspective. I’ve also learned to appreciate the little gains: the first time my bson watched an entire movie, his first joke (involving poop, of course! ), when he told me he wanted to sleepover at his cousins’ house again. I never thoughts these things would bring me such joy, but they are gains to be celebrated. This is the piece of advice I struggle with the most. 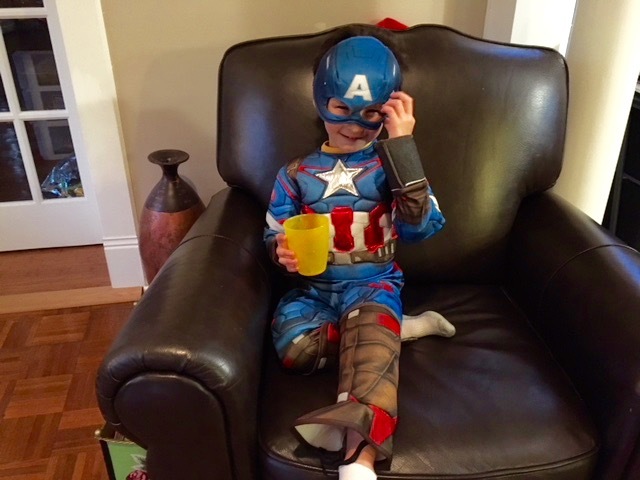 My son heads to kindergarten next year and I’m doubting whether we’ve done enough to prepare him—particularly socially—as kindergarteners these days are sophisticated creatures! Should I have enrolled him in in that evening social skills class? Should I have gotten more involved in school volunteer activities and connected with other parents? Maybe then my son would be invited on more playdates and would better be able to form friendships and navigate social situations. The guilt abounds. Aside from questioning my choices as a Mom, I also used to often feel guilty when I took time for myself to do something, like have dinner with a friend. I had brainwashed myself to believe that if I wasn’t doing something directly for my son, I wasn’t helping him. Today, I realize that I am a better person, daughter, sister, friend, colleague and Mom when not all the focus is on my son—and he is a better kid as a result of it. By not over-focusing on him, my son is better able to showcase his abilities and increased independence. Like the time when my sister took him to the park and he was pumping his legs on the swing when I came to pick him up, something I'd never seen before. Or the time I got stuck on a lengthy conference call, and he was quietly flipping through the pages of a book when I came downstairs. I am a proud Mom—but that is only part of who I am. I am also a fiercely loyal friend, the “cool aunt,” a writer and a tennis player with a pretty sweet serve. I’ve been told I make some of the best arancini balls on the planet. Before my son was born, I had plans and dreams of what life would be like at age 40, 45, 55 and so on. After my son was born and our suspicions of his disability were confirmed, I stopped planning. Life stood still. Autism was all-consuming: it zapped my desire to travel and to celebrate milestones like birthdays and promotions. And to some extent, it impacted friendships as I turned down invitations to social gatherings out of fear that people wouldn’t understand, or even worse, judge my son. These days, things are different. I miss that person I used to be, but the truth is, I am a work in progress. Love and support from family and friends buoy me and milestones are celebrated, as is daily life. As my son has shown me, you can live with autism and still have a great life. Jane Kim is coauthor of Top of the Class: How Asian Parents Raise High Achievers—And How You Can Too. She'd love to hear from you—feel free to share your advice on her post or email her at janeykim1976@gmail.com. This is wonderful. I hope more parents read this and follow the advice given. There is no shame in being a different kind of parent. P.s. Sharing on FB on my Out One Ear site! Thanks, Linda - congrats on the book! This article is a lovely & heartfelt expression of the joys & challenges of parenting, relatable for all parents but especially for those facing unique challenges of raising a child with disabilities. I applaud the author for sharing her experiences and perspectives on how to get through the rough moments. Forgetting about feeling guilty is probably one of the best things I've done for myself in the last year. Doctors can tell you timelines of when your kids should do things, but ultimately it's up to the child and a parent should not burden themselves with the guilt of what their child is or is not doing!